To all you snowbirds, particularly of the RV species, if you sometimes take for granted why it is exactly that you head south for the winter, the photos herein should renew your conviction. 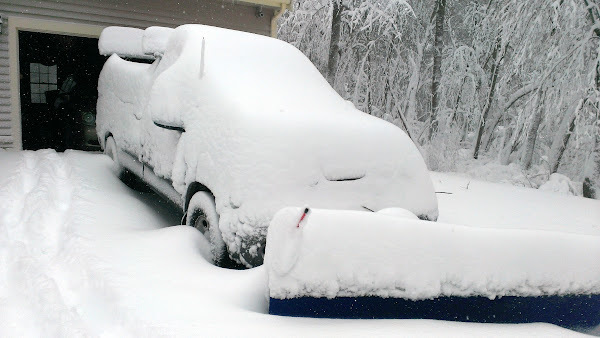 Well, everything they forecast concerning the blizzard became a reality! On Saturday we woke up to a winter wonderland. Amazingly we didn’t lose power during the blizzard despite numerous brownouts and flickering lights during the early hours of the storm. We did lose it for about an hour 2 days after the blizzard, but generally we lucked out. Remember how in my last post Rob thought he would do a plow run at least once during the night to keep up with the snow depth? Well, at midnight Friday the snow did not “look” all that deep so we went to bed. Turns out we should have done some late night plowing! Saturday morning when we ventured out into the newly frosted landscape, the snow was just about 2 feet deep and while not extremely wet, it was not the light fluffy stuff either. It was uncomfortably deep for our homeowner grade plow to handle effectively as it either came over the top of the plow or made the plow blade ride up leaving too much snow behind the blade causing the truck to eventually get stuck. So we had to plow by pushing the snow around in “stages” – it’s hard to describe but Rob eventually devised a way to move it off to the sides a little at a time. It took him about 6 hours to get our 300′ driveway clear, including the 4 or 5 times he got stuck. It stopped snowing about mid afternoon on Saturday. We will have no problem moving the coach down the driveway, our road however is another story! They finally plowed our road as of Sunday morning, but not very well. 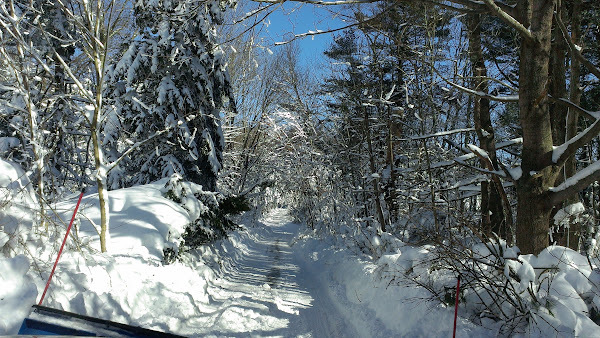 Also the trees are so laden with clingy icy snow making the branches droop so low (those that didn’t break off altogether that is) that passage even in a car is a bit touch and go. There is no way we could get the bus out of here with the road and trees as they are today! Would you want to drive your coach down this road (photo right)? That’s just after turning off the state highway, our driveway is about 0.2 miles further ahead. Hopefully the “warm” weather (mid 30’s) coming in the next few days will melt the snow on the branches and restore the overhead clearance (which has always been marginal for the motorhome). Next worry is the snow banks on the sides of our road turning to ice before the cleared area is widened – again as it is I think we could do some damage getting the bus out of here if we do get an opportunity to head south in the near term. When the temperatures rise we’ll have to try and widen things out on our own. Local roads were mostly passable (photo right) but there are many repairs still to be done, like this tree (photo left) that toppled and is resting on high voltage wires. The initial snow was wet and icy and brought down many good size tree branches as well. Good morning Rob & Linda. What a winter wonderland. There’s a lot to be said about living in the south. Take care. Hope to meet up with y’all some time this yr.